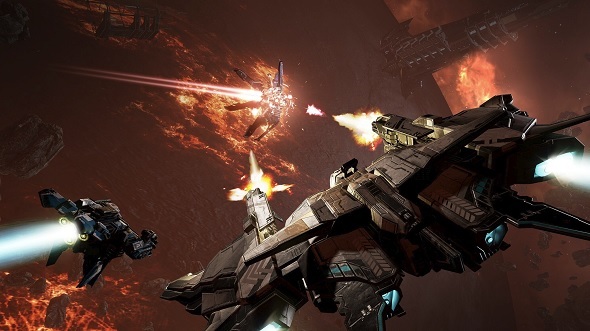 CCP are launching the free Warzone update for Eve: Valkyrie today. It brings a number of big changes to the first-person spaceship shooter. For starters, with Warzone, Eve: Valkyrie is no longer a VR-only game. That’s right, you can play it without a headset on your regular PC. Finally! It supports cross-platform and cross-reality play, too. As you can imagine, getting Eve: Valkyrie to work whether players are on mouse and keyboard, or playing in virtual reality, has required some rebalancing. We talked to CCP about that whole process and what more you can expect from the Warzone update before. But if you want the short version then keep reading. As we’ve highlighted before, Warzone also brings with it a bunch of new ships across different classes – which makes it a little more like Overwatch in that regards. Ships in certain classes have a specific role they should aim to play if they want to win. To go along with that, there are new maps and game modes, as well as an overhauled progression and reward system. If you want a closer look at the ships in the Assault class then we have a video you can watch on that below. Now then, to celebrate the arrival of the Warzone update, we’re giving away Steam keys for Eve: Valkyrie away to 50 lucky winners. As the Warzone update is free, having the base game gives you everything it includes, as well as any future updates heading to the game. To keep up with any announcements you’ll want to follow the Eve: Valkyrie Facebook page, its Twitter account, or the YouTube channel. You can always check out Eve: Valkyrie’s official forums for news and discussions, too. As to the giveaway, you can enter by using the widget below.Every action you complete is worth one entry into the giveaway, and the more actions you complete the more chance you’ll have of winning.We’ll also need your email address so we can send you a code upon winning – we won’t send you spam, we promise.